Now that the government shutdown is over and training is in taper mode, I can focus on the details of the marathon which are under my control. I did a test run in my race gear which will get some iron on and bedazzling customization this weekend. 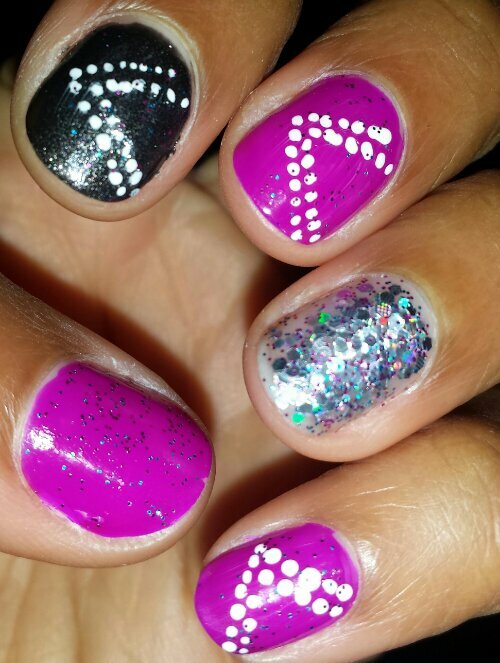 I’ve been experimenting with nail designs to complete the look. It’s the small details which give me that extra oomph of motivation. I was told it was not a good idea to run a marathon with a water belt because water and Gatorade will be supplied on the course. I see some people wearing the thin race belts to carry energy packs and hold race bibs. I didn’t train with gels and goos because I didn’t see a difference in performance and I like to stay as natural as possible. I’m going to miss my water belt for the marathon. I remember the day I dreaded running with a fanny pack. The first belt I purchased was a Runner’s World with the bouncy water bottle. It was a disaster! I was in TJMaxx and saw the two pink belts. I ran with the belt on the left and it was riding up on my waist. I will try to loosen it lower on my hips but hoping it doesn’t bounce. Another issue with this belt is the inability to neatly secure the loose ends. The thinner pink belt is not big enough to hold my Dad’s old school flip phone I will carry as immediate contact with my parents after the marathon. I would also like to carry my old Evo phone as a camera. You all know I have to take pics and do my colorful, little collages. 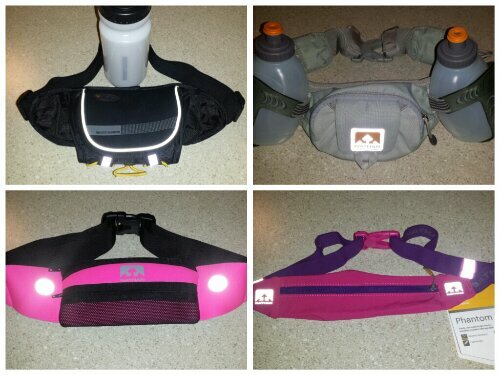 Do you run marathons with your water belt or a race belt? What are your race belt essentials? This entry was posted in fitness, marathon, running and tagged 5k belts, Marine Corps Marathon, Nathans water waist belts runner, Race Belts, Runner belts, Runner's World Water bottle runner. Bookmark the permalink. I do like the SpiBelt as a belt for races to put my gu, energy chewies and etc but I do not wear the water/fuel belts and have never worn them for training or racing. Don’t take that as gospel or what to do or not do. Just a preference. Every runner is different. What works for some, may not work for others. I do sometimes carry a small handheld water during races just to have the option to sip as often as I’d like. Some races I don’t carry it so I think you will be fine. Less distraction. I used the pink and black Nathan belt this morning for a quick 3 miler and I had to readjust several times. The left over straps were irritating and it kept riding up. At one point it was at ribs. I’m not dealing with that for 26.2. I’ve never worn one, but I was looking into the Spi Belts. I usually have pockets on my shorts that I put my Gu’s in. But last year at the Disney Marathon I had 4 in my pockets and was going to take one every 6 miles, but when I got to mile 6 I realized they had all fallen out of my pockets! D’oh! Also, not a race goes by that I don’t see all those little water bottles on the course that had fallen out of someone’s belt. One of the ladies in my running group has had problems with her bottle falling out her belt. She has the same style as mine. The spi belt reminds me of the thin belt I have pictured and never tried. The Running Hippie is making belts similar to that too. I think the spi belt stretches. I’ll check out the hippie! I ran mine with my water belt. Didn’t slow me down any. I had a fuel plan and stuck with it…which is how I trained because I didn’t want to hit a wall. I didn’t. I powered through to the end. Good luck!! I hope your plan works for you. You did excellent in Chicago! Still waiting on that race report. 🙂 Were your 2 bottles enough for you or did you stop for additional fluids? I carried 4 bottles at the recommendation of my sports nutritionist. Followed the plan she gave me for fueling…so as not to hit the wall (and I didn’t! )…and had a very strong and very good race. You gotta do what you think will work for you. This is how I trained…so, I had no questions going into it. I felt strong and I felt good…and it carried throughout as I put my race day plan into action. When I started this…I wasn’t going to wear my fuel belt at all. But I was happy I wore it and had it in the end. Well I might have to evaluate my plan. It would save time on the water stops which I hear can be pretty crowed up to the 1st 10 miles. I’m going to stick with the water belt. It will help to preserve the time to stop at water stations. Every second counts! I can’t wait to hear all about your run!! BTW…working on that race report. Life’s just been insane.